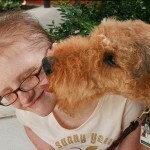 One of the stars of our local pet therapy organization, Paws with a Purpose, is a joyful Airedale named Pubb, who walks the hospital halls spreading smiles, comfort, and love to everyone he meets. Pubb and his “mom” Marti often visit pediatric cancer patients, as well as children who are about to undergo a forensic interview in situations of suspected child abuse. No matter why the child is at the hospital, Pubb’s furry medicine gives them the courage to face the often scary future. Pubb is estimated to be nearly 13 years old, and he recently passed his re-certification test as a Delta Society therapy dog, which is required every two years. On that occasion, Marti wrote the following heartwarming letter to the family who rescued Pubb. It’s a testament not only to Pubb, but to how a simple act of compassion continues to touch many lives. You may remember that in 2003 you picked up an Airedale in a lot of trouble on the side of the road and named him Pubb. He was on three legs, weighed 30-some lbs, had little hair, battle scars, plenty of heartworms and every other possible parasite. You and your family nursed him through the most critical phase of recovery and then Airedale Rescue transported him to his foster family. Let me say up front that this isn’t one of those sad letters written upon the death of a dog—he is absolutely fine and still acts like a puppy. Getting a little stiffer in his advancing years, but still would rather hike with me than breathe. Wrestles and plays endlessly with the three other Airedales in the house, and was the first to befriend the now-seven month old puppy Punch. His signature is a bulldozer-like move through one’s legs and he has been known to pick small people (I being one of them) off their feet. And when people hear how old he is (we guess about 13 now—estimates of his age when you rescued him were 5 to 7), they are in absolute disbelief. Anyway, this is by way of a love letter from Pubb, and it’s by way of letting you know the ripples of good things your good deed created. For my own part, I don’t think there has been a day since he arrived that Pubb (also called Bubbie—Pubb morphed into an affectionate Pubba-Bubba and thus he answers to Pubby, Pubb, Bubbie, Bupps, Bubb, Pubbster, Boobert and the rattle of a food bowl) has not made me laugh aloud, and the value of a dog that can do that is inestimable. My husband and I were to be his foster family. Since our list of then and previous dogs comprised Posie, Paw, Puff, Piper, Peach, Pixi and Jasper, (the latter who we were “just going to rescue and find a good home for,”) I should have known the deck was stacked for me to flunk fostering when a dog named Pubb walked in the door. He was in the second worst shape of any dog I’ve ever fostered, and that was after two weeks of loving vet care with your family. I shudder to think how he must have presented originally. It must have taken great courage to stop and pick him up. And, it was worse than you even knew—when we took him to be x-rayed to figure out what could be done about his crippled rear leg we discovered he was full of gunshot, and from more than one gun. There were different gauges of shot. It was at that point, as if it hadn’t been a foregone conclusion anyway, that my husband said, “That dog isn’t going anywhere ever again.” So I reimbursed Airedale Rescue for the vet bills and he became ours. He’s now on four legs with just a slight hitch in his gait. It was too late to do a hip replacement so he had a femoral head ostectomy but to our horror, wouldn’t put the leg down at all post surgery. So, we rented a beach house on St. George Island in January, when almost no one is there, and Pubb’s sand walking therapy (which worked) turned into an annual Airedale Beach Week for the family. Pubb still believes that water is not to be trusted, but he loves barking at his Airedale sisters Pixi and Peach while they swim. He has become a therapy dog extraordinaire, fabulous with disturbed kids, abused kids, kids with reading problems, and most of all, sick kids. Other than a couple of hand signals, his repertoire of tricks consists of “Gimme five” and “Speak” and he will do them endlessly for any child who asks. He was my late husband’s favorite and as John grew sicker, Pubb stayed closer. Since he was a therapy dog, he could come and go at the hospital and made those awful inpatient days so very much better, not only for John but for everyone he encountered. When the awful call came at 1 a.m., it was Pubb who came back to hospice with me even though he had been there all day. And he was with John when he died, just as they both would have asked if they could. Afterwards, he dedicated himself, as best a very light-hearted and comedic dog can, to being the man of the family. On his best days he even managed to look serious for a brief time. On the rest he settled for pinning me under the blankets while I slept. The three Airedales and I hiked our way through grief and Pubb loves those outings. In the late summer of 2008 we were on a familiar trail when Peach disappeared around a corner and we heard a crash and a canine scream. Pubb, Pixi and I ran forward, and there was Peach, under a black bear. The three of us charged the bear barking and yelling and somehow in the melee Peach regained her footing and (thank God my hobby is obedience training and showing) I was able to call them off the bear. But one look at the dogs with every hair erect and eyes wild told me I wouldn’t be able to keep them under verbal control indefinitely so I started loping sideways away from the bear, calling the dogs and clapping. What that brilliant move succeeded in doing was calling the bear after ME. …. And those three Airedales went into a dance that looked as if they’d rehearsed every day of their lives: one would charge the bear from the right and as the bear went for it, the next would charge from the left, then the center dog, etc. And the whole time they were doing this incredible routine of parry and thrust, they were backing me out of there. Pubby gained hero status far beyond the confines of this household where he’s always been one, and Peach escaped with only minor injuries. I could go on and on. But I wanted, while he is hale and healthy, to thank you from the bottom of my heart for saving this incredible, beautiful, hilarious miracle of a dog. There is no way to tell you how much happiness and laughter and comfort he’s brought into my world and the world of everyone who meets him. I truly do thank God every single day for him—and for you, for saving his life. This entry was posted on Thursday, May 6th, 2010 at 2:57 am	and is filed under Dog rescue, Favorite Animal Nonprofits. You can follow any responses to this entry through the RSS 2.0 feed. Both comments and pings are currently closed.